This strawberry cake mix cheese ball makes a fun & festive sweet appetizer that would be perfect for a pink themed party, shower or tea. Strawberry cake mix cheese ball is perfect for a baby shower or ladies’ tea where pink is the color of the day. It can be rolled in candy sprinkles or small chopped nuts. Served on a platter surrounded by cookies, it makes a lovely addition to any table. I love Biscoff, the cookies shown in this photo, but any cookie works well. If you have time, you can make cheese ball minis instead of one large ball. These actually make a better presentation, as once a big cheese ball is cut into by several guests, it doesn’t look great on a plate. The minis are perfectly portioned, so guests get a whole one along with a cookie or two. Make ahead: This is the perfect make ahead party food. It can be made several days ahead and kept in the fridge or up to a month ahead and kept in the freezer. If frozen, allow an hour to come to room temperature before serving. Note: My cheese ball in this photo isn’t perfectly round, as I didn’t have time to freeze it. Since it wasn’t firm enough to roll in sprinkles, I just pressed them all over the ball. If you really want a perfectly round ball, allow time to freeze it first. If you give this a try, I’d love to hear how you like it! Thanks so much for stopping by. Be blessed, and stay savvy!!! 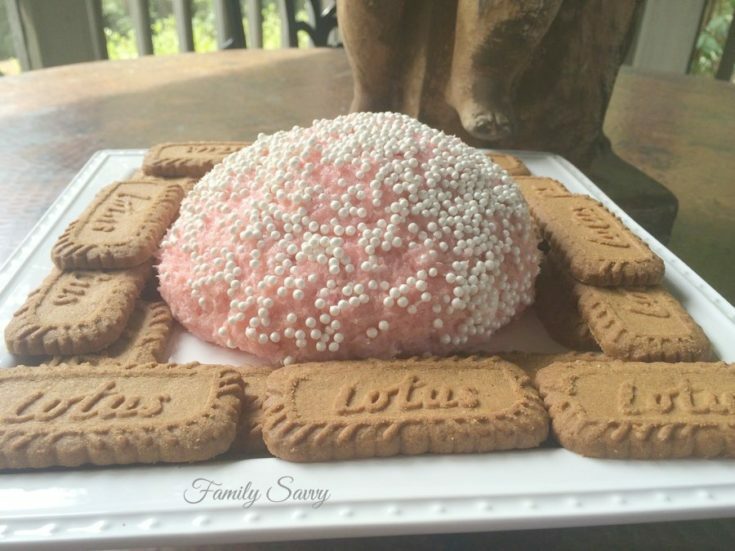 A sweet cheeseball that is pink, sweet, and delicious served with assorted cookies. In medium bowl, beat cream cheese and butter until well combined. Add cake mix and both sugars; mix well. Shape mixture into a ball. Freeze ball 2 hours or until firm. Pour sprinkles in a baking dish; roll ball in sprinkles until covered. Keep cheeseball in freezer, well wrapped, until an hour or two before serving. Serve with Biscoff or your favorite cookie.